Are you ready to get your learning on about the Fundamentals of Respiratory Care? I sure hope so because that is what this study guide is all about. This information correlates with Egan’s Chapter 8 on the Fundamentals of Respiratory Care Research, so you can use this information to help prepare for your exams. At first glance, you may assume that this topic isn’t all that important. I totally get it. Who likes doing research? Still — this is one of those topics that you must know as a Respiratory Therapy Student, which is why we created this study guide for you. So if you’re ready, let’s dive right in! 1. What are the reasons for understanding research? Becoming familiar with research concepts and becoming an educated consumer of research. 2. What are the 3 basic missions of academic medicine? 3. Who are the stakeholders in research? Researchers, Administrators, Clinicians, and Educators. 4. Who needs the ability to assess the usefulness of new equipment and treatments? 5. Who needs the ability to find, summarize, and present evidence for clinical activities? 6. Who needs to evaluate the quality of services and the validity of policies/procedures? 7. Who needs to be able to generate new ideas that inform the other stakeholders? 8. What is the skill that stakeholders have in common? The ability to read and evaluate scientific reports. 9. What do Bibliographic databases contain? They contain books, book chapters, reports, citations, abstracts, and either the full text of the articles indexed or links to the full text. 10. What is the most popular Bibliographic database? 11. What service of the U.S. National Library of Medicine that dates back to 1948 and includes over 18 million citations from MEDLINE and other life science journals for biomedical articles? 12. What delivers only the most clinically reputable content intended for practicing medical clinicians? 13. What are synthesized databases? They contain filtered records for specific topics and typically require a costly subscription. They assist in finding better evidence without as much research being needed through Bibliographic databases. 14. What is a webpage that acts as a starting point for using the Web or web-based services? 15. What is a good research topic for beginning respiratory therapists and why? New devices because they are inexpensive and may be donated to increase research numbers. Also, they do not require institutional review board approval. 16. What are some examples of Bibliographic software? 17. What are some factors that affect feasibility? Measurability, Availability (research subjects), Duration (how long is the study), Significance (what is the importance), Availability (money and equipment), and Knowledge (people conducting research). 18. What are three ways to present your findings in research? The abstract, The poster, and The paper. 19. What is the structure of a research article? Abstract/summary, Introduction, Materials and methods, Results, Discussion/conclusion, and References. 20. What is a condensed version of a research paper at the beginning of the publication? 21. Typically, how big is a poster? Generally 4 feet by 6 feet and allows the presenter to have more space to describe research than with an abstract. 22. What is the research paper word range? Has the same basic outline as an abstract or poster but goes into much greater detail. It is usually in the range of 2000-3000 words, depending on the journal. 23. What are the parts of a scientific paper? Introduction, Methods, Results, Discussion, and Conclusion. 24. What is a brief description of why the study was done, it’s importance, and the hypothesis? 25. What explains what exactly has been done to answer questions about the research or test the hypothesis? 26. What is the data gathered from experiments? 27. What section should interpret the results from previous studies’ conclusions? 28. What section should be briefly explained to include the reason as to why alternative interpretations would be rejected? 29. Research reviews are done by how many people? Usually done by 2 or 3 peer reviewers. 30. What are three recommendations for journal review? That your paper should not be considered for publication, Rejected with an opportunity to revise and resubmit, and That the paper should be accepted as is. 31. What are the categories of research? 32. What is Quantitative Research? Data collected for numerical analysis. 33. What is Qualitative Research? It increases the understanding of “why”. 34. What is Descriptive Research? Observes and describes associations between exposures and outcomes. 35. What is Analytic Research? Investigates relationships and tests hypotheses. It is also known as “explanatory” research. It is a service of the U.S. National Library of Medicine that includes over 18 million citations from MEDLINE and other life science journals for biomedical articles back to 1948. 37 What are the 3 missions of academic medicine? To heal, to teach, and to discover. 38. What are the 5 different parts of a scientific paper? The introduction, methods, results, discussion, and the conclusion. 39. What is found in the introduction of a scientific paper? The research problem or hypothesis. 40. What is found in the methods section? Details about the experiment and how you tested the hypothesis. 41. What is found in the results section of a scientific paper? The data from the experiments. 42. What is found in the discussion section of the paper? How the results answer the research problem. 43. What is found in the conclusion of the paper? Reasons for rejecting alternate interpretations. 44. What is the purpose of having a research plan? To clarify the goals of the study and the methods for the investigation and also to provide a guide for the entire research team. 45. What is a synthesized database? Prefiltered records for particular topics. 46. What is an example of a synthesized database? 47. What is a portal? Web pages that act as a starting point for using the web or web-based services. 48. What are 2 examples of portals? 49. What does OVID provide links to? Books, journals, evidence-based medicine databases, and the Cumulative Index to Nursing and Allied Health Literature. 50. What does MDConsult provide links to? 51. What is the purpose for interviewing a patient? To establish a rapport between the clinician and patient, to obtain information essential for making a diagnosis, and to help monitor changes in the patient’s symptoms and response to therapy. 52. Where should the patient be interviewed? 53. What happens in the social space? Your introduction to the patient; then proceed to their personal space. 54. What is a Bibliographic Database? A database that indexes publishing data for books, periodical articles, government reports, statistics, patents, research reports, conference proceedings, and dissertations. 55. What is a hypothesis? Web pages that users launch when they first log on to the Web. A computerized database operated by the National Libraries of Medicine that allows one to search many of the world’s science resources. 58 What is a Research Protocol? 59. What is a Synthesized Database? A set of computerized records or data which have been reviewed, interpreted, and categorized in relation to an area of research. 60. Is Respiratory Therapy Zone awesome for making all of these study guides for students? So there you have it! 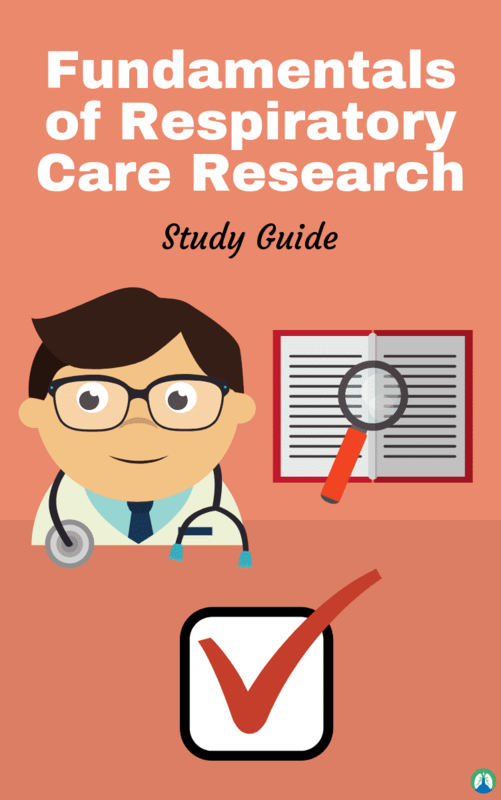 That wraps up our study guide on the fundamentals of research in respiratory care. I truly hope that this information was valuable for you. If you go through these practice questions a few times, I have no doubt that it will help you earn a higher score on your exams.